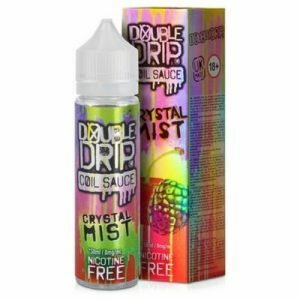 Double Drip 50ml shortfill. Fifteen fantastic flavours to choose from crystal mist, Sun drip, Raspberry sherbet, Strawberry laces and more! Fantastic value at only £11.99. sweetened fruity notes with crisp menthol. Like a refined slushie, Crystal Mist delivers refreshing blue raspberry with a chilly finish. Lemon Lime Tangerine. Sharp lemon and zingy lime with a heady injection of sweet tangerine, deliciously mellowed by a cooling menthol kick. Fizzy Cherry Cola Bottles is simultaneously refreshing and warming, making it a great year-round vape. A lavish sprinkling of sherbet crystals creates a deliciously-sour sensation on the exhale. Like berries? Love sherbet? 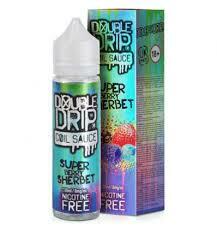 Super Berry Sherbet by Double Drip is a mix of berries sprinkled with sherbet for a sweet, sugary and super-juicy vape. Fresh raspberries are brought to life by the sharp sugary sherbet and you’ll be surprised how well the fizzing sherbet flavour has been captured. Double Drip Caramel Apple Cake is a delicious cake mix flavour with a blend of apples, caramel and vanilla sponge. Strawberry laces flavour with a sherbet twist. This juice neatly solves your cravings by serving up a fruity feast with a generous dollop of vanilla ice cream. Lemon Sherbet is a masterful blend of fizzy sherbet and sweet lemon for a tingling citrus experience. Twisted Ice Cream captures the unique taste of a favourite summer treat. Tangy lime sorbet and strawberry ice are twisted up with pineapple ice cream to create an exciting and layered flavour.